The day started off bad as our mentor, Timothy was still unwell. It was up to the two of us, myself (Khayhen) and Jia Jen to handle a swarm of 30 kids. 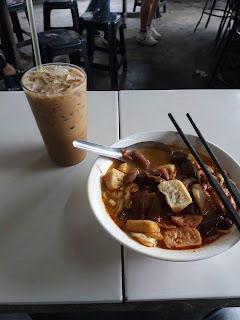 We departed early as we wanted to have a try of the famous labi-labi mee soup in Kuala Pilah, which was a short detour from the school. Labi-labi apparently is a type of turtle (don't worry its a type of pest turtles not sea turtles) which they put in the soup which is a delicacy in Kuala Pilah. I had a go at it and it was surprisingly really good as the meat was really soft and tender. Jia Jen didn't dare try it as he claims it was too "exotic" for him. After the hearty turtle meal, we left for the school. This workshop was a little unusual as we were giving a 3D printer workshop to primary schools. This is quite advanced to them who have never even heard the term 3D printer. Rather than use the surface modelling based design software SketchUp, we decided to use TinkerCad, which is a simpler online 3D design software. Although the software is quite limited compared to SketchUp, it is much easier to grasp the concept of 3D modelling with it. In addition TinkerCAD, has a very useful in-build tutorial and a colourful interface that definitely makes it easier for the kids to use. The workshop started off a little chaotic as we needed to get the kids to create an account to sign in to TinkerCAD. This took quite long as a lot of the kids couldn't remember their email or password. With the help of the teachers we manage to got everyone's account working and proceeded to the next part of the workshop, the keychain design. While 3D designing is the most complex course among the 4 workshops we conduct, a handful of the participants managed to design creative keychains. Unfortunately due to shortage of time we could only print one of the keychains for the kids. 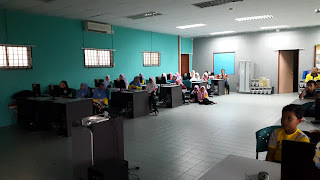 Eventhough they were just primary school kids, they all showed lots of interest in 3D designing and I'm sure some of them of them will continue designing after the workshop. Thankfully Timothy was feeling a little better after we finished at the school. So he met us at our hotel and we went for us a nice dinner at a famous satay shop in Seremban.